25. 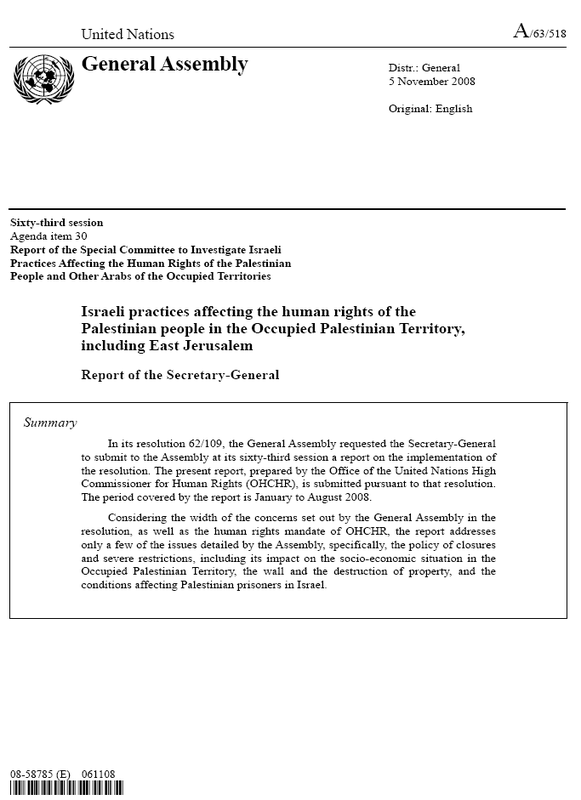 August 2008 UN General Assembly, Situation of human rights in the Palestinian territories occupied since 1967 : note / by the Secretary-General, 25 August 2008. A/63/326. Report of the Special Rapporteur on the Situation of Human Rights in the Palestinian Territories Occupied since 1967, Richard Falk, submitted in accordance with Human Rights Council resolution 5/1; covers the period from 1 Jan.-31 July 2008. 5. 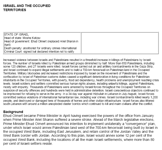 November 2008 UN General Assembly, Israeli practices affecting the human rights of the Palestinian people in the Occupied Palestinian Territory, including East Jerusalem : report of the Secretary-General, 5 November 2008. A/63/518. 5. November 2008 UN General Assembly, Israeli settlements in the Occupied Palestinian Territory, including East Jerusalem, and the occupied Syrian Golan : report of the Secretary- General, 5 November 2008. A/63/519. 1. September 2008 Report of the High-Level Fact-Finding Mission to Beit Hanoun established under Council resolution S-3/1. Report on the Massacre committed by the IDF in Beit Hanoun on November 8th 2006. 24. January 2008 UN Human Rights Council, Resolution S-6/1: Human rights violations emanating from Israeli military attacks and incursions in the Occupied Palestinian Territory, particularly in the occupied Gaza Strip, 24 January 2008. Resolution S-6/1. Israel killed more than 650 Palestinians during 2006. More than half of the Palestinians killed were innocent Civilians, and of these 120 were Children. 21 Israeli Civilians including 1 Child and six Soldiers were Killed by Palestinian armed groups during 2006.